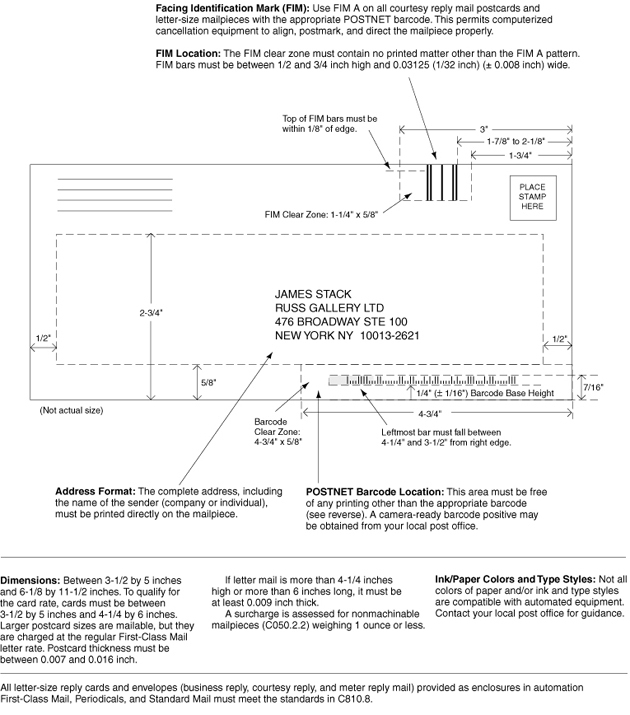 The links below are provided as a quick resource of envelope design considerations. The information provided has been taken from the USPS web site. If you are designing your own mailing components we recommend your visiting the USPS site and reviewing current guidelines as they may apply to your application and use. Those links are provided. Business Reply Mail (BRM) Business Reply Envelope "BRE"
Courtesy Reply Mail (CRM) Courtesy Reply Envelope "CRE"
The return address tells the USPS where the sender of a mailpiece wants it returned if the piece cannot be delivered. The return address contains elements corresponding to those for the delivery address. 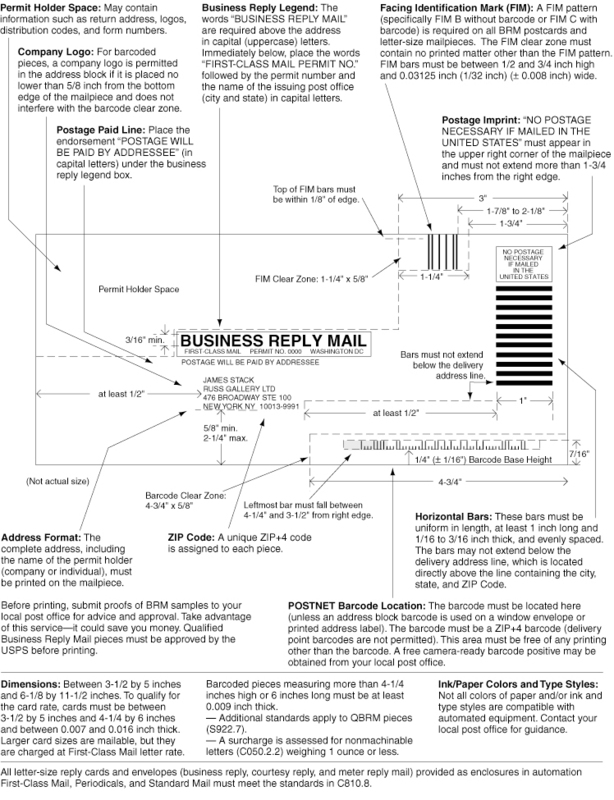 Although the sender’s name is required in the return address in only specific circumstances (under 4.3), if the sender’s name is not included in the return address, another clear designation (apartment, suite, or room number) is required to ensure proper handling of ancillary services and/or return of the piece. Business Reply Mail (BRM) allows a mailer to distribute preprinted First-Class Mail reply pieces to customers. The mailer, not the customer, pays the return postage. The mailer does not prepay postage on BRM pieces. The Postal Service collects postage only on pieces that the customers actually send back to the mailer. 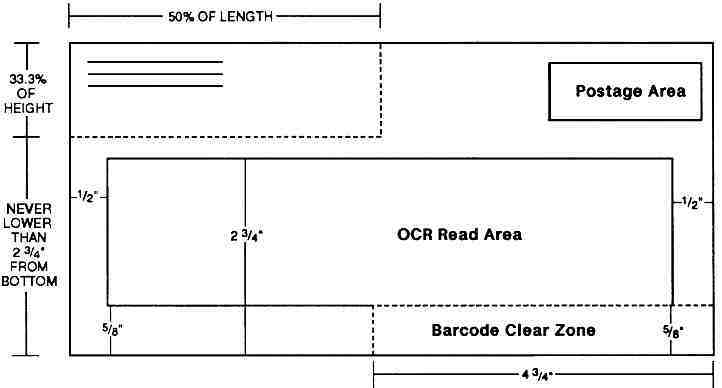 This allows mailers to save postage costs on large volumes of distributed reply pieces when a response is not assured. > BRM is appropriate when your customer needs a little extra inducement to reply — in other words, the response or its timing is not certain. This type of reply mail is frequently used by direct marketers seeking to encourage orders, researchers needing survey responses, or magazine publishers soliciting subscriptions. > The extra inducement is provided by the fact that your customer does not pay the return postage, does not have to supply a postcard or envelope, and does not need to put an address on the mailpiece. The USPS requires no fees or prior authorization to distribute CRM.